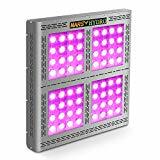 Most grow lights in this price range produce a lot of watts (300 watts and above) and can illuminate up to 25 plants. 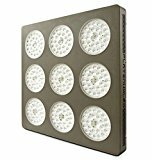 Because of their good coverage, these lights are ideal for experienced growers who want to grow many plants at once. 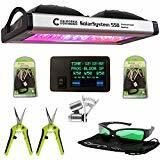 The best LED grow light for $1000 bucks is definitely the Advanced Platinum P600 Grow Light. Platinum LED knows how to make grow lights, and this one attests to the company’s expertise. It has very high ratings and is a favorite among indoor growers. Its coverage is one of the best, it can produce enough light for 14 big plants. It is also one of the least expensive lights on this list. While the cheapest light here is the Diamond Series 200W Light by Advanced LED Lights, it doesn’t emit a lot of watts (only 185 watts).